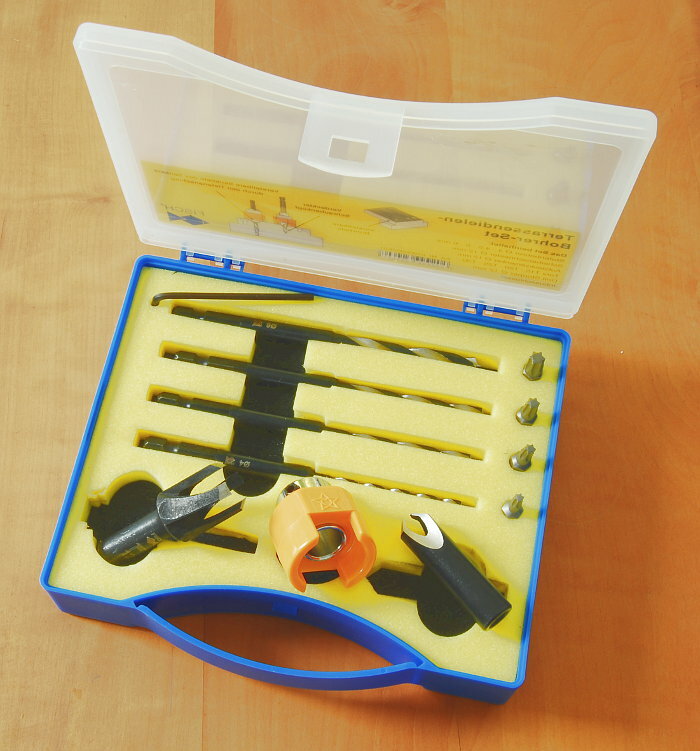 With this patio/deck drill/counter sink set you can make quick, clean and tear-out free pilot holes in one pass. With the new slot geometry the shavings clear almost perfectly. 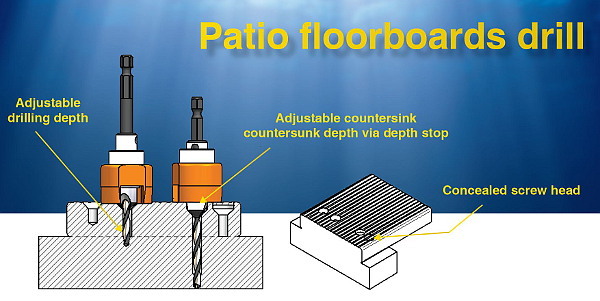 The boring depth and counter sink depth can be steplessly set and fixed solidly with the adjustable depth stop. Big jobs like decks are where this tool shines, but it can of course be used for pilot holes in a thousand applications. The tool also allows straight-sided countersunk holes to be bored so that the screw heads can be covered with a plug or putty. It cuts 12 mm holes, and you can use a plug cutter to cut plugs out of the scraps of the wood used for a perfect color match and less waste. The bit assembly is made up of a bit/countersink combination. With it you can use drill bits of 4, 4.5, 5, and 6 mm. 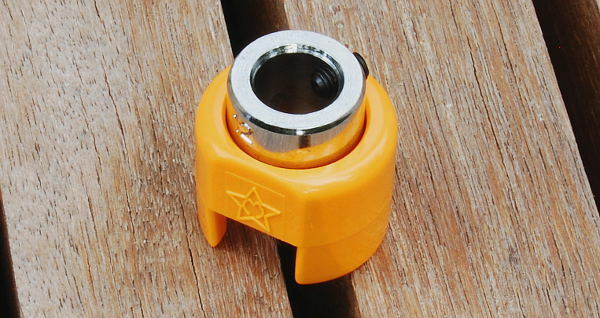 The bits for the set feature a 1/4 inch hexagonal shaft, which allows quick changes with a slip-free fixation. In this Video the use of the bit set is demonstrated. 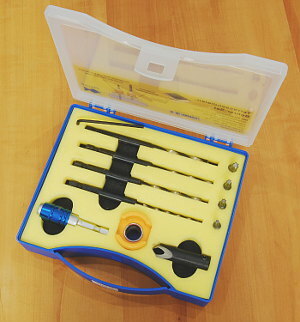 Note: The tool kit shown in the video can differ from the one we sell. In the video demonstration, you might notice that some plugs are driven into the holes with their grain across that of the board. It works much better in many ways, especially cosmetically, to use the plugs with the grain running in the same direction as the board! A drill bit with a total length of 110 mm and a boring depth of 50 mm, which is reduced to 42 mm if the counter sink part is used. 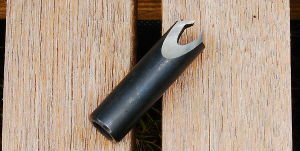 The bit’s shaft is 7 mm in diameter where the countersink is fixed. Where the bit fits in the drill’s chuck, the shaft is a standard 6 mm hexagon (1/4 inch). A countersink with an internal hole of 7 mm in diameter and an outer diameter of 12 mm. It is 44 mm long. A drilling depth ring. We also sell the same thing in our Drilling Depth Ring section. 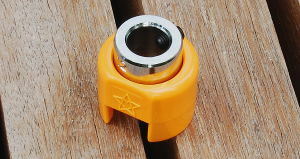 The ring has a rotating cap in plastic, which when it contacts the work piece stops rotating. This prevents damage to the workpiece through friction heat or scratches. Because of the precise finish tolerances involved in the manufacturing the countersink, threading the bit into it is a little tricky. The bit must be exactly centered and straight, or it will jam up before it is completely inserted. It cannot simply just be pushed straight into the countersink, but must be carefully threaded. Be careful that the two countersink points are threaded into the spiral grooves. The advantage of this design, is that the chips can be cleanly and easily cleared, and do not hang up between the countersink and bit shaft, slowing drilling and risking potentially damaging heat buildup. The disadvantage of the design is that it is a fiddly job to install the countersink and one must do it carefully. Note: when ordered individually, you need to add the countersink and the depth stop for a complete set. fits all four bit sizes! 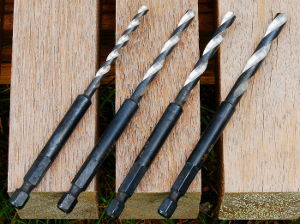 To fix on countersink, fits all four drill sizes! These depth stops are also available in other sizes! Allen key 2.5 mm included. Cover the screws with wood pins made with the plug cutter that comes with this set.